HOUSTON (CN) – A Texas grand jury indicted two current and three former jailers on charges they beat an inmate so badly in the state’s biggest jail that they broke his nose and eye socket, forcing him to undergo a four-hour facial reconstruction surgery. The Harris County grand jury’s indictment on Tuesday comes more than a year after new security cameras in the jail in downtown Houston, the county seat, reportedly captured several jailers beating Jerome Bartee, a 29-year-old black man, in September 2016. The Harris County Jail is the state’s busiest. There were 7,718 inmates there at the end of November, down from 8,235 in January 2016, according to a Harris County Sheriff’s Office spokesman. The jail has a checkered history of guards beating inmates and neglecting them, which prompted the U.S. Department of Justice to launch an investigation in spring 2008. The federal inquiry concluded the following year, finding conditions at the jail and treatment of inmates were often unconstitutional. Despite promised reforms, the troubles continued, as 55 inmates died in the jail from 2009 to 2015, according to the Houston Chronicle. Bartee was booked into the jail on Sept. 3, 2016. The next day he told staff he had a severe toothache and asked to be taken to the infirmary, according to a federal lawsuit Bartee filed a month after the alleged beating. 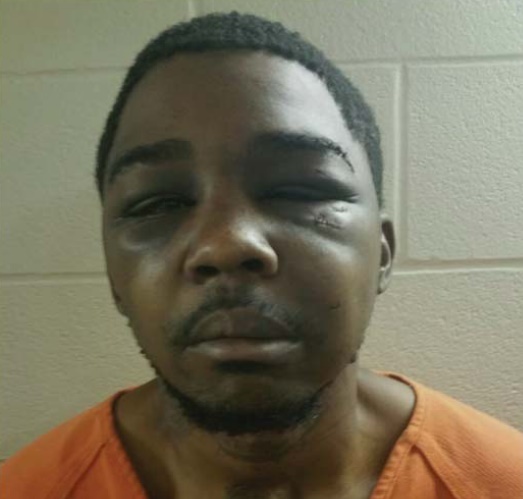 The lawsuit includes before-and-after photos of Bartee’s face – his booking photo, in which his face has no apparent injuries, and a photo following the alleged assault, which shows his left eye swollen shut and dark bruises under his also swollen right eye. He says in the lawsuit that as former jailer Andrew Rowell escorted him to the infirmary, Rowell pushed him into a door and he cried out, prompting two other jailers to join Rowell in attacking him. Harris County District Attorney Kim Ogg highlighted the damage the officers allegedly did to Bartee’s face in a statement announcing the indictments on Tuesday. “The evidence shows these detention officers crossed the line when it comes to the use of force. They caused severe injury to an inmate who needed screws, stitches and a plate to reconstruct his face and a shattered eye socket,” she said. Of the five indicted officers, two were fired shortly after the incident: Rowell and Salvador Garibay, according to a statement from Harris County Sheriff Ed Gonzalez. Gonzalez said Jeremy Ringle was fired in February after an unrelated use-of-force investigation into a July 2016 incident. The sheriff said the other two indicted officers, Napoleon Harmon and Joshua Degler, will be taken off duty in keeping with sheriff’s office policy. The grand jury charged Rowell, Ringle, Harmon and Degler with felony aggravated assault by a public servant. If convicted, they face penalties of five to 99 years in prison, or a life sentence, and a $10,000 fine. Garibay was charged with a Class A misdemeanor assault, which carries a maximum penalty of one year in jail and a $4,000 fine. Gonzalez praised his predecessor Ron Hickman for taking three of the officers off duty after Hickman saw footage of the alleged beating. Gonzalez stressed that jailers are being trained how to avoid putting their hands on inmates. All the indicted officers, except Harmon, are defendants in Bartee’s second amended lawsuit, which also names Harris County as a defendant. To back his municipal liability claims against Harris County, Bartee alleges its practice of encouraging staff to subdue inmates with as many jailers as possible caused his injuries. Bartee’s attorney, Donald Kidd with Perdue and Kidd in Houston, said that Bartee’s vision in his left eye is still impaired. “The beating still haunts him,” Kidd said. Kidd said the indictment bolsters Bertee’s claims against Harris County. “The first-degree felony indictments of four detention officers is evidence of the Harris County Jail’s longstanding custom, policy and practice of using excessive force on inmates and detainees,” he said. Harris County assistant attorney Jim Ezer is representing several of the individual defendants in the lawsuit, including Degler. Degler claims in an Aug. 15 answer to Bartee’s amended complaint that qualified immunity should shield him from all Bartee’s claims. Qualified immunity is a powerful defense that protects law enforcement officers from liability if the alleged violation was of a constitutional right that a reasonable person would not have known about. Ezer did not immediately respond Wednesday when asked if the indictment undermines Degler’s immunity defense or if the charges will lead to settlement talks with Bartee.